6 Bedroom, 6.5 Bathroom Deluxe Beachfront House With Pool And Elevator. 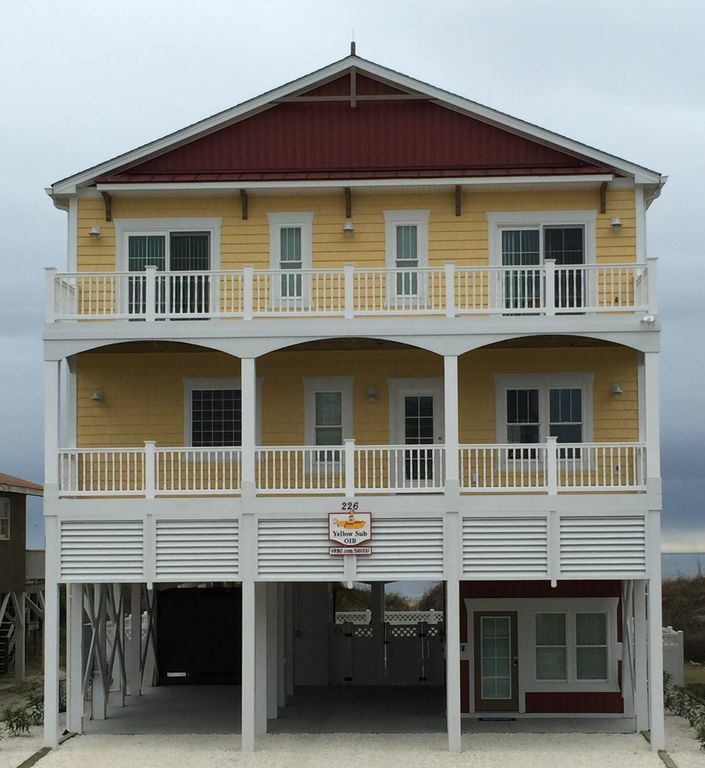 Make The Yellow Sub OIB your vacation home and create memories you will not forget. This stunning house, built in 2014, is oceanfront and it has all the amenities. The house has 6 bedrooms, 6 ½ bathrooms, a gourmet kitchen, TVs and ceiling fans in each room, WiFi, decks overlooking the ocean, a private walkway to the beach, a pool, Tiki bar, a lounge area by the pool, an elevator to all floors and private parking. The house accommodates 16 not including a sofabed. The most frequently made comment about The Yellow Sub OIB is that the pictures don’t capture the beauty of the house and the awesome panoramic views of the beach and ocean. The main floor of the house has an open floor plan combining the kitchen, and dining and living areas. The living room has two sofas and movable chairs for conversation, viewing TV/movies, or watching the surf. There is an entertainment center with a smart TV, a Blu-Ray player, and a stereo receiver with surround sound that can be played throughout the living and dining areas. A wet bar is also located in the living area. The dining area has two tables with seating for 16 people. The gourmet kitchen has spacious granite counters, including a raised area with bar stools for eating, working on projects, or watching the chefs. The appliances are stainless steel and include a large refrigerator, dishwasher, separate ice-maker, oven, and microwave, and the counter contains a flat top cook stove. Family meals are easy to prepare with the pots and pans, measuring cups, etc. that are there, and there are sufficient number of plates, glasses, and flatware for everyone to enjoy a meal together. The master bedroom, with a king bed, is on the main floor and the master bath includes a rain shower, garden tub and walk-in closet. The upper level of the house has 5 bedrooms; two facing the ocean each with a queen bed, two facing the street each with a double and a single bed, and a room with two bunk beds. The house is decorated with playful colors and each room has a theme which will leave you talking about the house and humming the yellow sub theme. The ground level has an in-ground pool, which is partially under the house and therefore can be used on rainy days. The pool is heated from April through October. In addition, the ground level has a Tiki bar, gas grill, and lounge deck with deck chairs. This is a great place for cookouts, conversation, play, or just relaxing in the sun away from the sand. There are decks on the main and upper levels facing the street and there are decks on the main and upper levels facing the beach/ocean. Those facing the beach/ocean provide a panoramic view of the beach that is spectacular. A private walkway leads to the beach and there are two out-coves in the walkway which can be used as areas for conversation or to soak up the sun. A few steps from the house is a wonderful, white-sand beach and the gentle waves of the ocean. Take a blanket, couple of chairs, or some sand toys and enjoy the beach. The Yellow Sub OIB will not disappoint. It is perfect for weddings, family reunions, friends getting together, retreats, golf outings, etc. Thank you for considering The Yellow Sub OIB as your spot in the sun. Ocean Isle Beach is known for its beautiful white sand, wide beach vistas, and family-oriented activities. We particularly like Ocean Isle Beach and the surrounding area because it is close to shopping, restaurants and many forms of entertainment. We always take long walks on the beach, often stopping at the local merchants. There are concerts, festivals, and parades on the island, and a wonderful museum with knowledgeable curators. We enjoy day trips to Myrtle Beach, South Carolina; Wilmington, North Carolina; and other Brunswick County towns and beaches. The day trips often include shopping, shows and great food. There are a large number of outstanding golf courses nearby, as well as other water sports and fishing. We like the small town feel of Ocean Isle beach and the closeness of a larger community for food, entertainment, and shopping. It is a great combination that keeps bringing us back to the southeastern part of North Carolina. Modern beach house on the ocean built in 2014. Well appointed with all the amenities. The house has stunning views, an open floor plan, a heated pool (April through October) and all the things one needs for a memorable vacation. Great for family reunions, weddings, business retreats, and a group of friends enjoying the beach. Decorated with a theme throughout the home with vibrant colors. Each room has a story and is appointed to enhance the experience. The Yellow Sub OIB will leave you telling your friends about this vacation experience. outdoor shower, Outdoor shower and dressing room by pool. All bedrooms have private baths, half-bath in common area on main floor, outdoor shower and dressing area by pool, and outdoor shower on private walkway to the beach. The house is ocean-front and has spectacular views of the beach. There is a private walkway to the beach with two sitting areas. The beach in front of the house is wide with white sand. The house was built in 2014 and is located on First Street in Ocean Isle Beach, North Carolina and it is directly on ocean. There is a private walkway providing direct access to a wide beach. Central HVAC with separate controls for the lower and upper levels. Bedroom, bath, and kitchen linens, sheets, pillows and bedspreads provided. A GE washing machine is available to the guest and washing detergent is also provided. Wireless internet that is accessible in all rooms, decks and the pool area. Bath towels provided. Guests should provide beach and pool towels. Maytag stainless steel dishwasher with hidden controls. GE Energy Star stainless steel french-door refrigerator with icemaker and water and ice dispenser on door. GE stainless steel beverage center in lounge on 2nd floor. GE stainless steel electric cooktop with stainless steel exhaust hood. GE stainless steel built-in wall oven. GE stainless steel built in microwave on main floor and separate microwave in lounge on 2nd floor. Four piece toaster for bread and bagels. Full compliments of cooking pots and pans, dishes and glasses, flat-ware, and serving dishes. Gourmet kitchen with granite counter tops; island with raised eating area that seats five; oven, microwave, flat cook top, separate ice maker, dishwasher, stainless steel sink, and appliances. Two parallel dining room tables overlooking ocean that seats 16, plus nearby island seats an additional 5. Flat-screen TVs in living room on main floor, Lounge on 2nd floor, and all bedrooms. The TV in the living room is a Smart TV with access to the internet and appropriate apps. A surround sound system is in the living/dining areas that can be used with the TV, as a radio, or with USB or cable connection to other electronic devices. DVD/BlueRay player in living room on main floor and in the Lounge on second floor. A miscellaneous collection of books is available. A miscellaneous collection of games and puzzles are available. The smart TV in the living area has a Pandora account on it for playing music off the internet. A miscellaneous collection of sand toys is available for use in the pool or on the beach. A miscellaneous collection of movies is available. Street side and oceanfront balconies (decks) on main level and second floor. Sunning deck by tiki bar and in-ground pool, as well as decks on the main and upper levels on the street side and on both levels facing the ocean. There is an elevator to all floors, including the ground area where the pool is located. Bathrooms are not to ADA standards, although the half bath can accommodate a wheelchair. The rain shower in the master bath can also accommodate a wheelchair. Private in-ground, heated pool (April through October) with sitting areas, deck/lounge chairs, grill, sink, and Tiki bar. The outdoor living area is enclosed with a privacy fence. The most frequent comment provided in the Guest Book is that the pictures don't do the house justice. Past guests comment on the stunning views from the kitchen, dinning and living areas, and from the decks overlooking the ocean. Ken & Betty; who are the sweetest & most understanding people ever; have outfitted the Yellow Sub with just about everything you could possibly need with the exception of food & beverages. No detail was left untouched. They are people after my own heart with labels for everything! The master suite was well appointed & exceptionally inviting. The enormous double rain head shower was very relaxing. The elevator was very useful to bring all the luggage up to each floor. Nick and I hosted 55 friends & family for our wedding. 13 friends stayed in the house with us & the rest of our friends & family stayed nearby at The Winds. Our wedding was catered by Art Catering in nearby Shallotte. The multiple decks are awesome and were used throughout the wedding. You would never know there was that many people there because everyone was mingling & taking advantage of every square foot inside and out. The most used compliment was "the pictures online do not show how grand this house is". We can NOT say enough wonderful things about the Yellow Sub. We have already started planning a return trip for next summer!! Walking into an immaculate, beautifully decorated house is a wonderful start to a beach vacation. The Yellow Submarine has every amenity a person could want, starting with the elevator which made it possible for one of our family members to come. The kitchen is well-furnished for any kind of meal preparation. Having dining seating for 16 made it possible for everyone to eat together. The bedrooms have comfortable mattresses, and the adjoining baths are so convenient. We really enjoyed the pool and bar area. The water toys for the kids were a big hit. We enjoyed our time on the decks, which have plenty of comfortable chairs. An exciting event for us was being there as one of the turtle nests was boiling. Although most came out later, we did see one little turtle make its way to the ocean. Amazing! We had such a wonderful time and are so grateful to Ken and Betty for providing such a beautiful place with so many special touches. Don’t hesitate to book. Do it now! We enjoyed it very much. It was perfect for our family of twelve. Worry free, comfy and beautiful view! The owners are super organized and have thought of every possible detail - from a large icemaker in the kitchen to a Keurig on the bedroom level, and a binder with local info and menus. The view from the deck is amazing and the elevators enabled our older relatives to come and go to the pool and their rooms. Plenty of parking for our 6 vehicles. The property is well maintained and when we emailed a question during the week, the owners were quick to respond. If we come to OIB again, we will be sure to try to stay here. One of the few vacations when we were not really ready to go home at the end of the week! Fantastic place best ever for us !! All the amenities and then some ! Fun Beatles themed interior, beautiful pool with tiki bar ! If reservation is made within 60 days of check-in date, an initial payment is due at the time of reservation and the remainder is due 3 weeks prior to check-in.